UPDATE: I've written an update on my butcher block counter tops - you can read it here. I hesitated to even write this post about my counter tops because we were winging it the whole way and I don't want anyone to think this is a tutorial! It is not! However, I decided to just write it and share some of my thoughts and observations and a few of the things we did learn. We had some serious discussions about counter tops and what we should do. 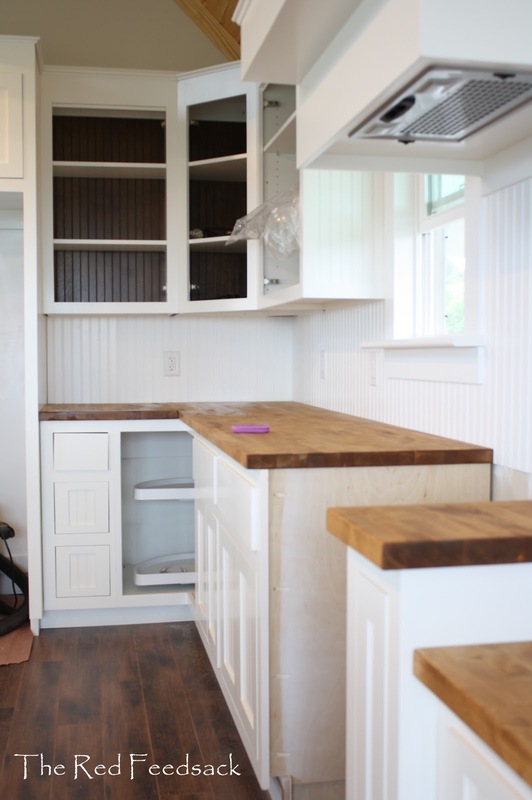 I kept leaning towards butcher block because of my daughter's counters that I love so much. However, I stayed open minded and read and researched everything.... and kept coming back to butcher block. So then, the hunt was on. The tricky part was finding planks that were big enough for our island. IKEA actually carried the large ones and luckily had what we needed in stock. 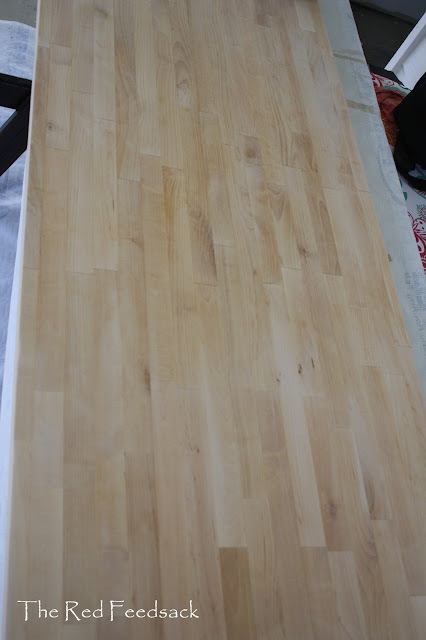 I wanted to darken up the Birch planks but really wasn't exactly sure how to stain and finish them in a food safe way. So back to the research I went! It is amazing to me how helpful people can be and when I sent emails asking for help I always got quick and expert replies. 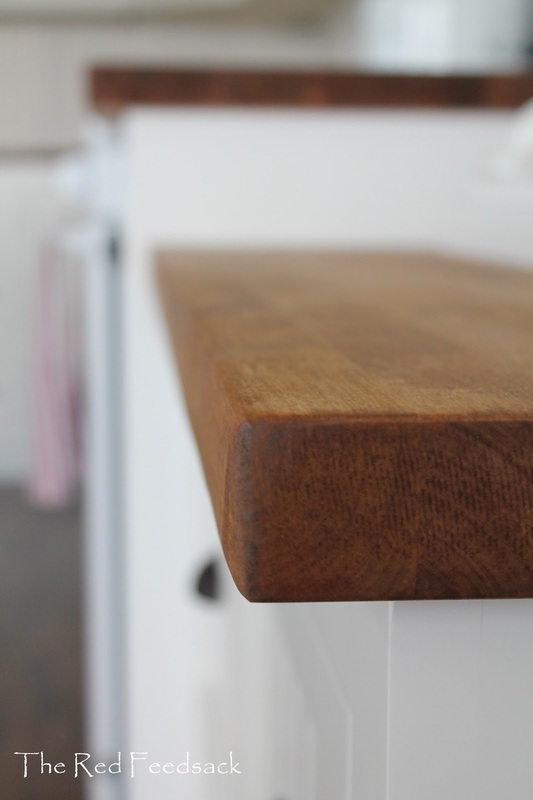 Probably the advice that was the most helpful in directing me, was from a blogger who finished her butcher block with tung oil and she told me that over a year later, with just a little consistent oiling, her counter tops were more gorgeous than ever. So, I sent an email to the company Real Milk Paint that sells natural paint and stain products, including tung oil. They wrote me back the most informative email about why finishing butcher block counter tops with tung oil was the answer. No stain, no varnish, no unsafe products, very little maintenance. So, following their instructions and advice, I finished all the butcher block with Dark Tung Oil mixed 50% with Citrus Solvent. It was the easiest process imaginable. Apply, let it dry, rub it soft, repeat, stop the application when the oil no longer soaks in the wood. 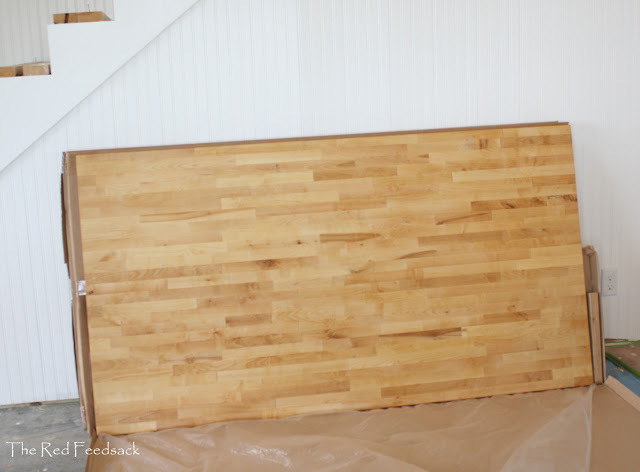 It was recommended to me that I oil both top and bottom of the planks, so all this was done prior to installation, although Eldon had already cut the planks to size. They took on a positively rich, beautiful finish. The tricky part was the island. 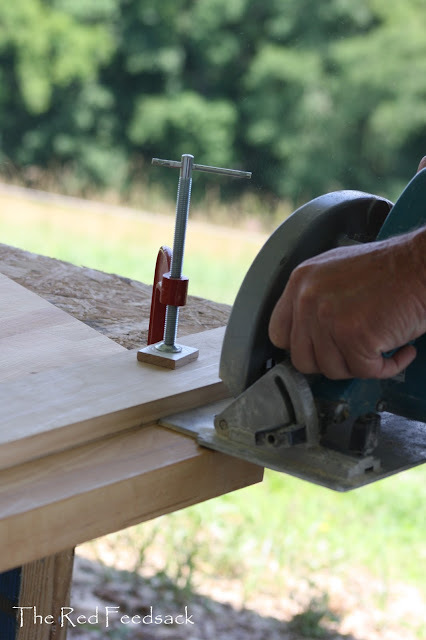 It required the three large planks, all cut differently and with a lot of calculating and figuring. Very odd angles that needed to be mitered and fit perfectly together. Not to mention the trickiness of cutting faucet holes and cutting and fitting the farmhouse sink. Eldon wants me to mention here that when it came to getting the rounded corners for the sink to fit perfectly he used a hole saw and then fine tuned it with a Farrier's rasp (a horse hoof trimming file)! It worked excellent! (Of course he just happened to have that on hand!). 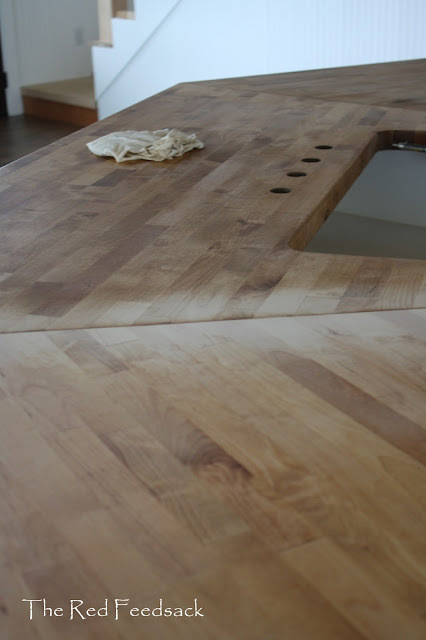 Once the island counter tops were in place and attached permanently then I sanded the mitered joints until they were smooth as silk. This is what the wood looked like at that point, which sort of scared me. 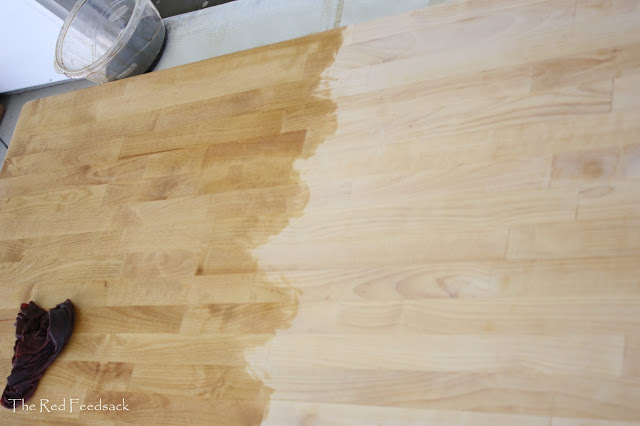 However, I have learned from my daughter's counter tops that that is the joy of butcher block, it is very forgiving... sand out imperfections and oil them back to perfection! I don't think anything else would've made me as happy as the butcher block and given me the farmhouse kitchen look that I wanted so badly. I've been told many, many times by many people that butcher block gets prettier and prettier. The more it is used, the slicker and glossier it gets! If you haven't read my full kichen post yet, you can read it here. 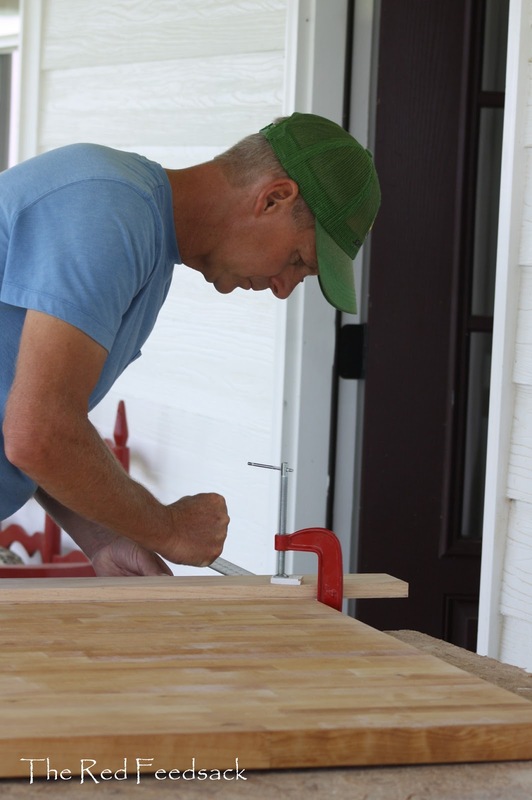 On the house this week: I have my work cut out for me in sanding, staining and varnishing our solid wood five panel interior doors. Eldon is multi-tasking plumbing and floor trim. We are close my friends.... VERY CLOSE!!! 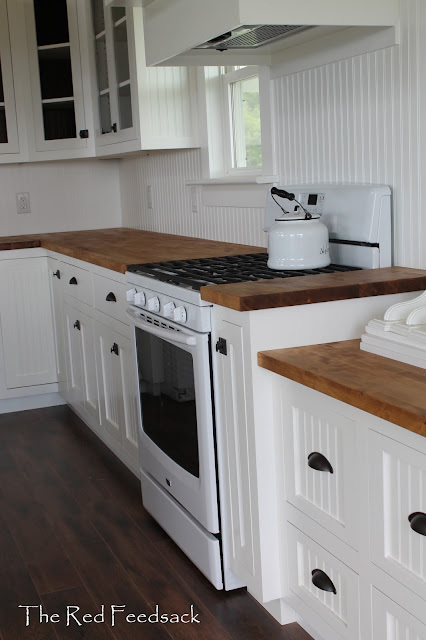 I love the butcher block... looks great and wonderful choice for your home. Your house is beautiful.. Cannot wait to see the finished decorated home. Blessings! I really liked your post today. We also used Ikea birch butcher block for our countertops last winter. Like you, I looked into all the different types of materials and came back to the butcher block that I had in another house 25 years ago. Our island is granite and has the cooktop so I left that because it's easier to clean when it comes to cooking but I adore my butcher block counters. I can take a piece of sandpaper to a small stain and reapply the tung oil and it's good as new. Since they are against the walls my hubby (a builder/remodeler for 45 yrs) cut 4" strips for the backsplash which gives me a small ledge. Ikea also sells a great wood cutting board with a lip that's always being moved from one area of the counters to the island. Absolutely stunning! Very informative also; thank you for sharing. 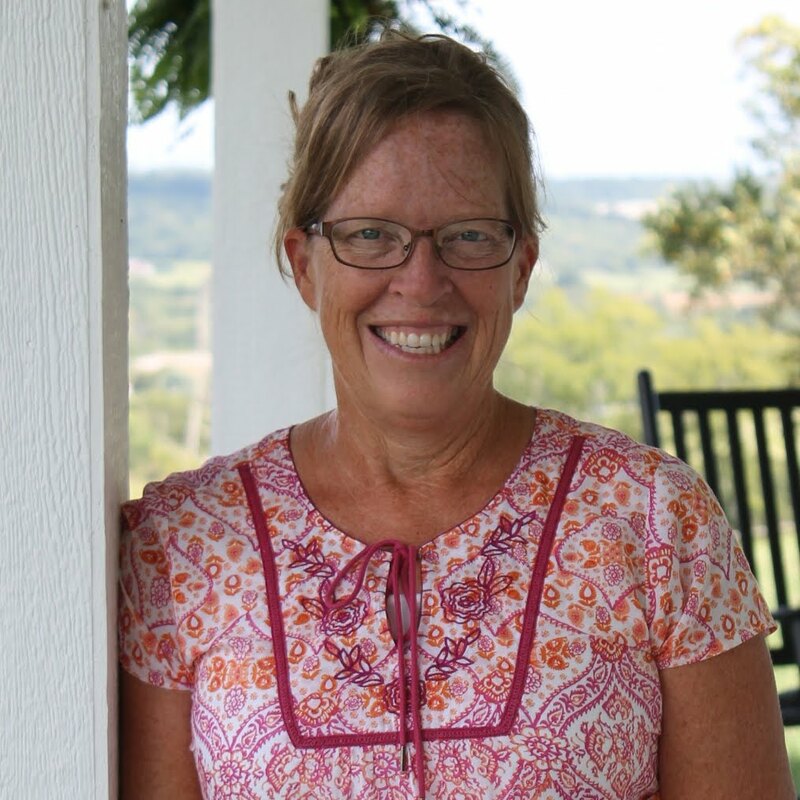 Dori, one thing I love about your blog is that it represents true DIY! Your hubby and mine must be related since they seem to be able to build anything. My hubby has recently built a fence and gate to screen the driveway and garbage can area from the yard. In the middle of the project his gate design went awry. He thought, pondered, measured, looked at his supplies, repeated that and then, voila', he figured it out. 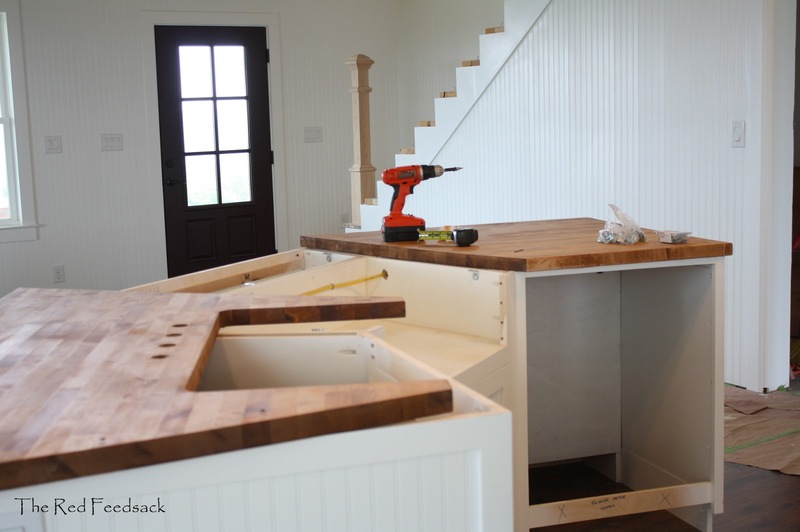 Your countertops are perfect for your farmhouse kitchen! Did you use the FIXA diffusion barrier only on the counter top edge? Courtney, yes it is only a strip of barrier that fits under the counter top edge and prevents the steam that rises from forming water under the counter top. You and your husband AMAZE me! Love that you are both pouring so much into this house(I suppose I should use the word HOME) of yours. I can picture you both working together to build on this dream! This is beautiful and exactly right for the look and feel of your kitchen. What a beautiful home. The love and attention to detail is everywhere! I'm so glad you share all this with us! I didn't notice it in the above post, but how long did it take each coat to dry/soak in? I am leaning towards Butcher block for our kitchen also. I have signed up to recieve your posts via email . . . off I go to check out more of your blog. Tina - the time varied on each coat but the first coat was very quick to soak in and dry(maybe about 15 minutes), the next coat a bit longer and then the third coat never did fully soak in and I followed the directions, which was to wipe off anything that didn't soak in. I've given them all one more coat of oil since then and one very light coat was all they needed and it was fully penetrated in about 30 minutes. I imagine it all varies on the type of wood, the age of the wood, etc... Thanks for reading! WOW . . . that didn't take long at all. Which is what I would need considering my kitchen is grand central station and if we had to go more than 1 maybe 2 days without a kitchen . . . the world would stop spinning, HA! Hello! I am visiting from the Pinterest party and I'm so happy to finally meet you, Dori! I follow your daughter's blog and I have always admired her countertops. 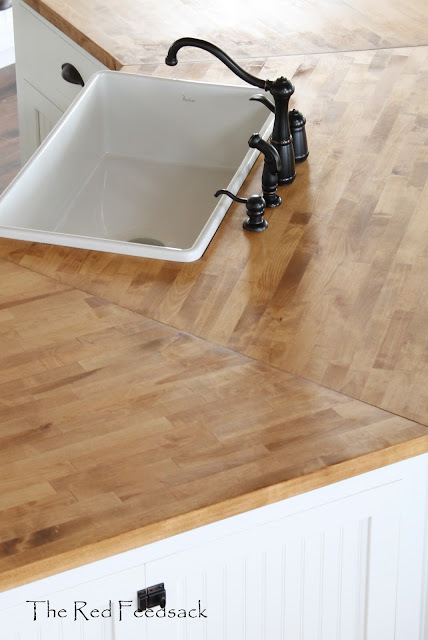 If we ever get around to a kitchen renovation, I want those same butcher block countertops from IKEA. Your husband did an outstanding job cutting those pieces to fit around your sink! 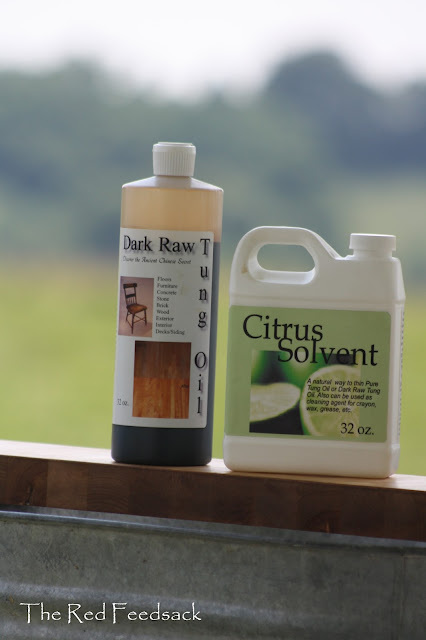 Thank you, thank you, thank you, for sharing your experience with the dark tung oil. 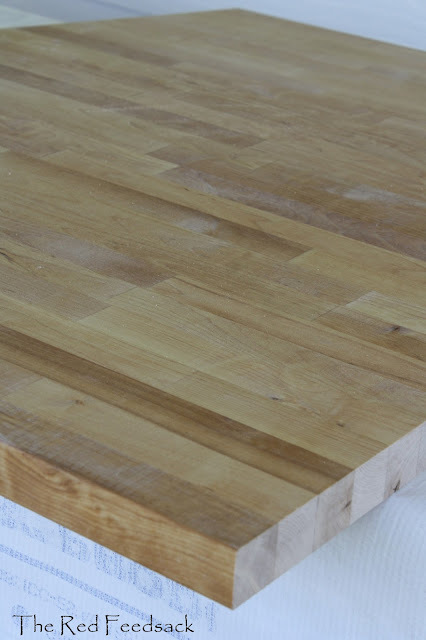 We have the beech butcher block countertops from Ikea and they are sized, cut, and ready to finish. We have been researching and researching and just when we thought we had made a decision on a finish, we would read something new and rethink and re-research it all over again. We really wanted something food safe, but really wanted a dark finish. I don't know that the dark tung oil will give us the exact deep tone we wanted, but it is a beautiful finish that delivers all of the other characteristics we are looking for in a finish. Thanks for all of your photos and info, this post was the final push that we needed to order the oil. I hope everything goes well with the beech. I have a question though, how much of the oil and citrus solvent did you go through? We are considering butcher block for our island. When my husband check Ikea for it, their width was only 35+ inches and we need a wee bit wider for our existing island. 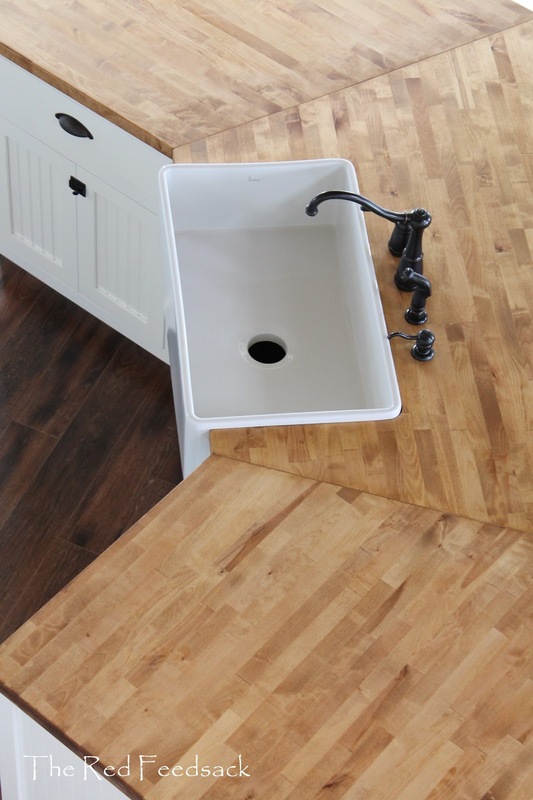 Your sink area looks much wider than that, what size were you able to get? Love your kitchen, it's the same look I am going for . Beverly - I do not remember the exact width of the butcher block we purchased from IKEA for our island, I think it was right about 40 inches. I recently had someone tell me they no longer carry the extra wide. I do know that when we purchased ours we could only get the extra wide in Beech. Check that and see. Good luck!! Its great to find such pretty amazing coutertops made of wood, it will really enhance the interiors and the restaurant. 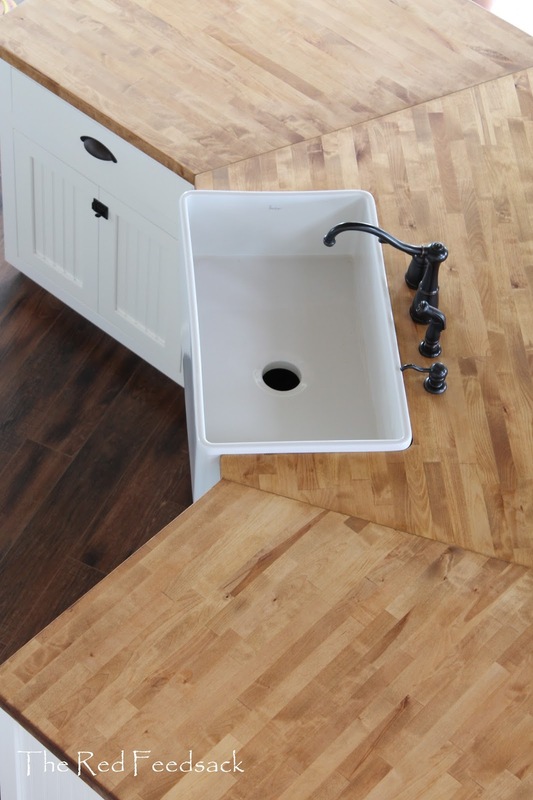 I just installed a farm sink nearly identical to your depth in butcher block countertops! We are also winging it, having never done it before! 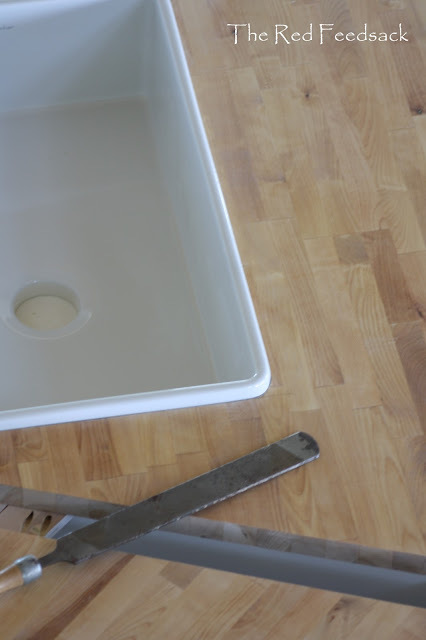 Did you caulk around the edges of where your sink met the butcher block? Thank you for the help! Hi Dori. I am trying to decide which countertop to go with, and I saw you mention your "birch" tops, but I also saw where maybe you purchased "beech". Which one did you go with? I want the same look that you have with the color of the top combined with the tung oil, so I want to be sure to select the right wood. Thank You so much! Is it necessary to use wood conditioner before applying the dark tung oil citrus mix on a birch hardwood butcher block island top??? Can I ask what you did to seal the countertop next to the farmhouse sink? I too wanted butcherblock and was told not to do it because if the sink leaks it will ruin the wood. What did you do to seal the wood right next to the sink? Thanks! I used an all natural Tung Oil from realmilkpaint.com and it is fantastic. I have had ZERO problem with water next to the sink. Obviously I wipe down water spills when they occur but I am not paranoid about it. Three years later and my counter tops are still perfect and believe me I am not easy on them! The area around my sink and faucets looks exactly like it did the day they were installed. If you would like to see some recent pictures you can email me. Thank you for this valuable information. We will be remodeling our kitchen and I also lean toward butcher block counter tops. You helped me make the decision final. Your kitchen is divine! I ordered from real milk paint just as you did but do you have to use a wood conditioner before the ting oil mixture ?